Text	 DIVINATORY MANUAL OR STAR CHART? 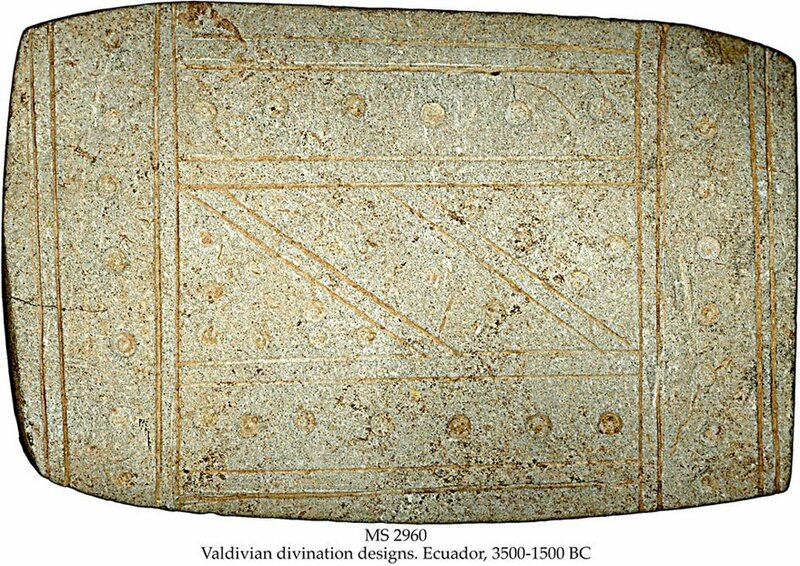 Description	 MS in Valdivian on grey limestone, Ecuador, 3500-1500 BC, 1 tablet, 13x20x2 cm, central panel of 2 triangles and 1 parallelogram separated by double lines, filled with 8+5+4 drilled holes, surrounded by 4 rectangular panels within double lines filled with 6+7+7+8 drilled holes, slightly curved corners. From the Piguiga hoard. For similar examples see MS 2961 and Sotheby's New York 2.6.1999:26, and 22.11.1999:22, both dated to 2300-2000 BC. 2 more examples published by Alvaro Guillot-Munoz: Les Pierres gravées pré-valdivia. Bruxelles, May 1997, VAL 19-20, dated to 3800-2800 BC. Provenance	 1. Private collection, USA (-2000); 2. Bruce Ferrini, Akron, Ohio. 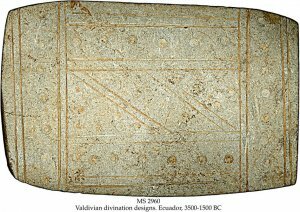 Commentary	 The Valdivian or pre-Valdivian stone plaques or star charts are the earliest evidence of "writing" from the Americas. The scholars disagree on their dates and meaning. The earliest dating is contemporary with the earliest writing of Sumer and Egypt. The latest dating is about contemporary with the earliest writing of Europe, Indus Valley and China. The Valdivian culture flourished along the central coast of Ecuador, beginning in the period 3000-2700 BC, persisting until about 1400 BC. Its pottery is one of the oldest in the Americas. Its resemblance to the Jomon vare of Japan has led some scholars to believe that it was introduced into Ecuador as a result of Trans-Pacific contacts.